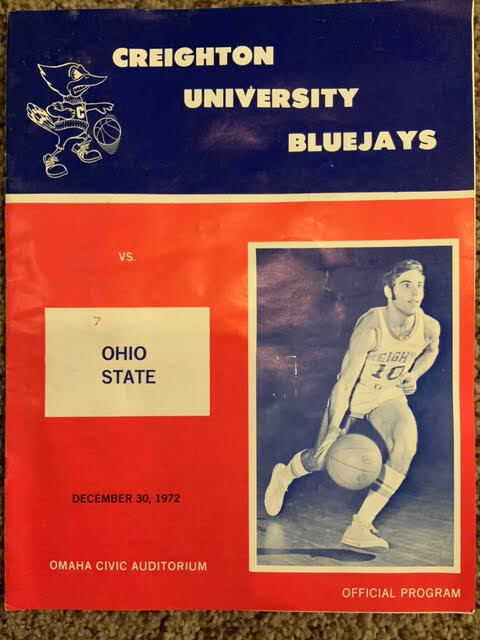 The first “big-time” basketball game I ever remember seeing was a game between Ohio State University and Creighton University at Omaha Civic Auditorium in Omaha on December 30, 1972. Our family was visiting my grandparents during the holiday season. My Uncle Mel came over and said he had some tickets for the Creighton basketball game and asked who wanted to go. 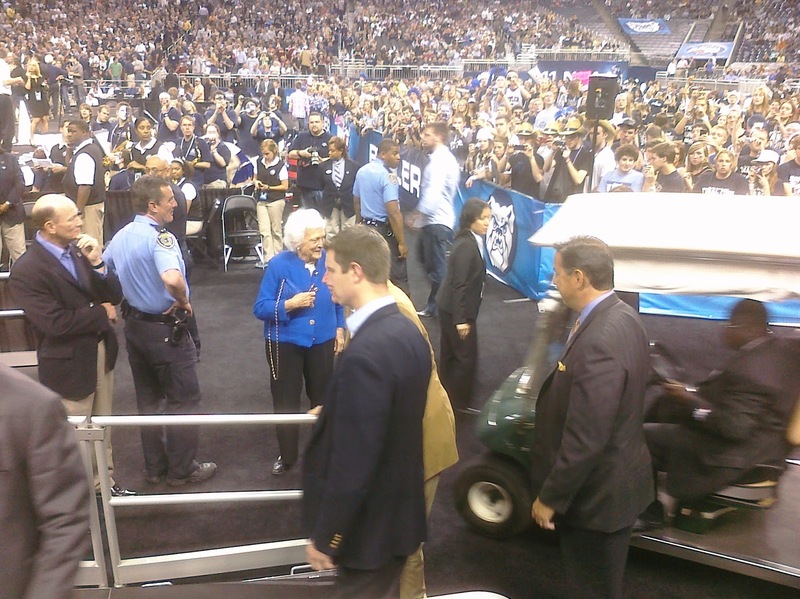 I was 12 years old and had never been to a college basketball game so I was in immediately! 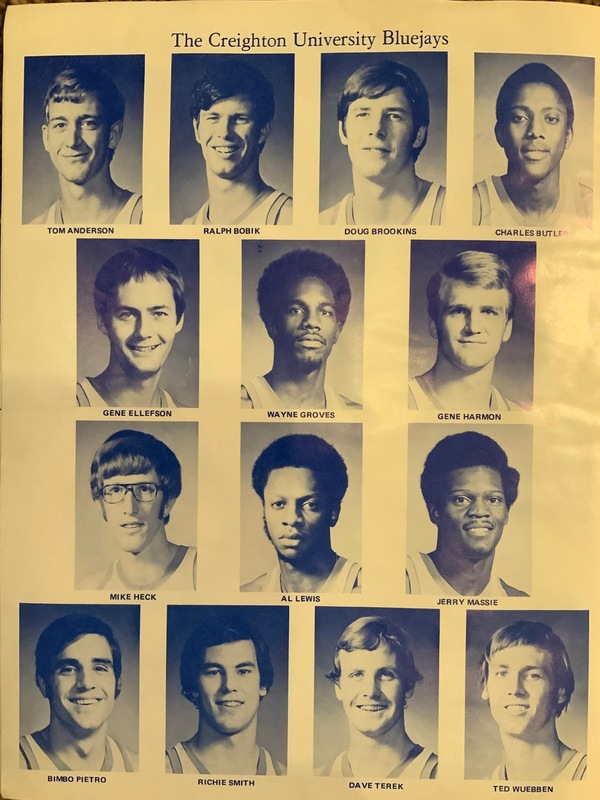 Even though it was a mid-major Creighton team, the visiting Big 10 Ohio State raised the profile of the game considerably. 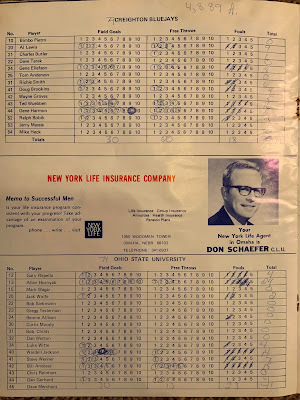 Ohio State dominated the Big 10 in the 1960's. Under Fred Taylor, they won three outright conference titles, shared three others, won the the 1960 National Championship, and finished national runner-up in 1961 and 1962. Creighton was the first of four schools that legendary coach Eddie Sutton took to the NCAA Basketball Tournament. 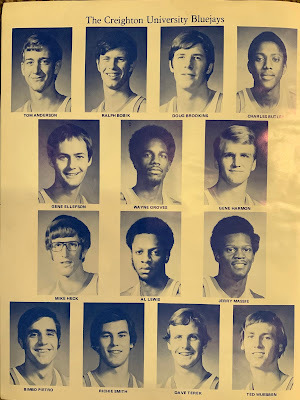 He went on to take Arkansas, Kentucky and Oklahoma State to the Big Dance later in his career and he reached the Final Four with Arkansas in 1978 and Oklahoma State in 1995 and 2004. Sutton was coaching Creighton than December afternoon. Fred Taylor’s Ohio State team came in to Omaha Civic Auditorium with two superstars. Allen Hornyak was a senior who led the Buckeyes in scoring three straight years and earned All-Big Ten Conference honors each year and All-America recognition as a senior. Luke Witte was also a senior who had been a standout for OSU until his injuries in the infamous OSU-Minnesota brawl, a year earlier, on January 25, 1972. I remember being awed at Hornyak’s shooting skills. He was filling it up from everywhere. This was 20 years before players were awarded an extra point for their long distance prowness. Hornyak averaged 24.0 points that year. The crowd, all 4,889 of them, were into the game from the opening tip. They carried Eddie Sutton’s Bluejays to a 79-71 upset of the visiting Buckeyes. Gene Harmon led the Jays with 22 points. I kept my program for that first college basketball game. I recently came across it while going through the "archives". 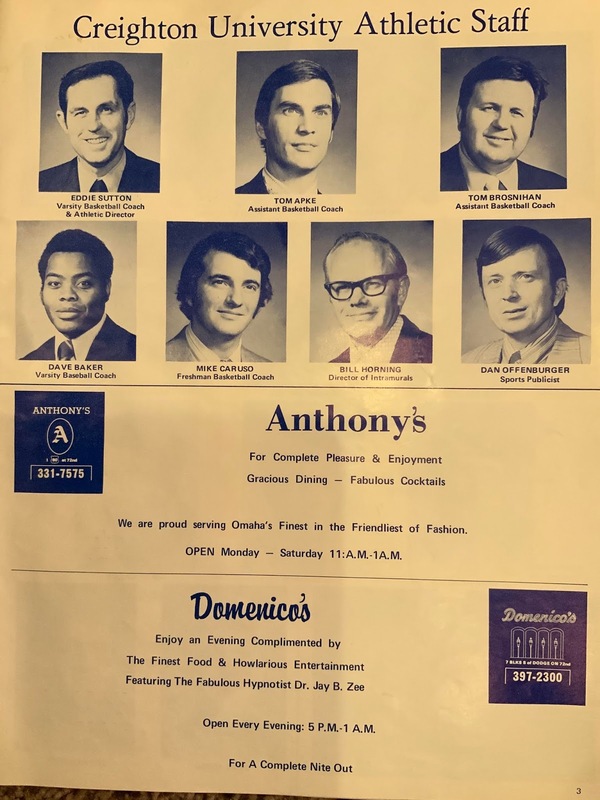 It was fun to see the names and even the ads in that program. You can see in the photo of the scorecard that I did my best to score the game. I'd be really surprised if the points on my scorecard matched the "official" stats. I loved the atmosphere of my first college basketball game and immediately began looking forward to my next game. Unfortunately, it would be another six and a half years before I saw another game. More on that later. The recent passing of former President George H.W. Bush reminded me of my "experience" with him and his wife Barbara. While it was not a personal experience, I was close enough to them that it felt personal. As I have documented, I am a college basketball fan and I annually attend the game's season finale. Houston hosted the 2011 Final Four. Butler beat VCU and Connecticut beat Kentucky on Saturday's semifinal games setting up a "canine" championship match up between the Butler Bulldogs and the UConn Huskies. Despite the seventh row listed on the tickets, we were pleasantly surprised to see our seats had no seats in front of us when we got to them about a half hour before the tip off. After we got settled, an extended golf cart pulled up just in front of us. Sitting on the back seat of the cart were former President George H.W. Bush and his wife Barbara. Houston was their adopted hometown and they were not going to miss one of the city's biggest sporting events. They were helped to their seats a couple rows in front of us and right in our line to the court. I have lifelong friend who is a talented writer. He wrote this essay and shared it with me. He has permitted me to post it here. I've added a few photos. He's capture the spirit of this annual event perfectly. I am fortunate to have a friend with whom I've been able to share it. Enjoy "Opening Day" by Craig Kirsch. In this small central South Dakota town, it’s the biggest day of the year. Bigger than the high school’s homecoming, bigger than the Fourth of July, and even eclipsing Christmas in terms of visitors and traffic. It’s the opening day of pheasant season, in the heart of the best county of what is regarded as the number one state for ringneck hunting. The city of Winner, located in Tripp County, a normally quiet community of 3000 residents, can boast of a proud tradition of excellence on the high school football field, as well as being the childhood home of Notre Dame legend Frank Leahy, but it's the area’s consistent abundance of the colorful game birds that it is most famous for. The second or third Saturday of each October will find the small burg transformed into a thriving metropolis for hunters. The normally tranquil town thoroughfare is packed bumper to bumper with four-wheel-drive pickups toting dog kennels, and drivers and passengers clad in blaze orange caps and vests. Every motel room in town is occupied, and seats in restaurants are tough to find for that morning’s breakfast. Come noon, however, the streets are silent and eateries unoccupied, for everyone is in the field awaiting the noon whistle, signaling the start of the hunting season. 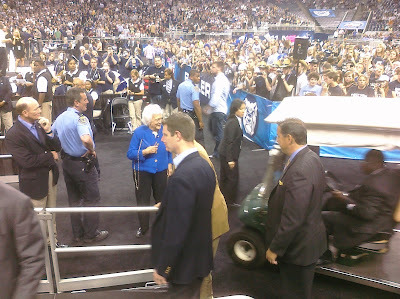 I've written about my Final Four adventures before. This year brought another interview. This time by Blair Kerkoff, long time Kansas City Star sportswriter, U.S. Basketball Writers Hall of Famer and author of several books. He and Kansas City Star photojournalist, Allison Long, came to our hotel, The Crockett Hotel,, which is across the street from the Alamo, to interview our group on the Saturday of Final Four weekend. Despite the rather awkward setting, sitting on the beds in our hotel room, we had a lot of laughs as well recalled some of our memories from the last four decades. The six of us had over 160 Final Fours attended all together. I was reminded how lucky I am to have a wife and family that are tolerant and understanding of my love for college basketball, to have employees and businesses that allow me to be away each year. and health, despite a scare, that has allowed me to attend. I am also lucky to have some great friends, who are as fortunate as I am, to be able to share this weekend with each year. Christopher Korth of Kansas City and Doug Knust of Chamberlain, S.D., are attending their 37th consecutive Final Four. They and friends who have been going to the NCAA Tournament semifinals and finals for 15-30 years plan their trips long in advance. This is my final column as the South Dakota NADA Director so I want to start off by thanking you, my fellow dealers, for the opportunity to serve in that capacity for the past nearly 11 years. I appreciate the input, feedback and support you have given me as we worked together on the challenges facing the automotive industry both nationally and in our state. I reflected upon the (over one hundred!) columns I have written during my tenure. What a long, strange trip it's been! Among the challenges we faced together were: The Great Recession of 2008, CAFE Standards, Red Flags Rule, bridge loans for automakers, automaker bankruptcies, "Cash for Clunkers", facilities image programs, the Dodd-Frank bill and creation of the CFPB (and our exclusion from their oversight), navigating the barrage of Obama Administration regulations (Risk Based pricing, Privacy notices, etc. ), the threat to repeal LIFO, stair step programs, electric cars, autonomous vehicles, disparate impact allegations, recalls and, most recently, tax reform. In 1994, we won a Chevrolet sales contest that rewarded us with a trip to Disney World in Orlando. The trip was in January 1995. Judy and I planned to take our two kids, Rachel (8) and Alex (5), on the trip which Chevrolet promoted as a family trip. This was all B.S. (before Sarah, our youngest child, who hadn't been born yet). It was a journey to drive two hours to the airport in Sioux Falls, catch an hour long flight from Sioux Falls to MSP, then fly 3-4 hours to Orlando. We then retrieved luggage, found ground transportation and made our way to the resort. We were all tired by the time we arrived but there was a party taking place when we got there and the kids were excited to explore things. Chevrolet's "Welcome Party" took place on the beach near the causeway between the Swan and the Dolphin. There were many food stands with different types of cuisines. There were games and activities for all ages on the beach. We were all walking through the party wide-eyed, taking it all in. Suddenly, we realized that Alex was not with us. As we looked around, we didn't see him anywhere. Had it been a regular Disney crowd, we would have really been concerned. Since it was a private party, I wasn't quite as worried. As it was, we quickly started backtracking to try to find him. I became a Bruce Springsteen fan in the summer of 1978 which was the summer after I graduated from high school. It was the summer that Springsteen released “Darkness on the Edge of Town”. Growing up in rural South Dakota, I did not hear anything but a little pop and a lotta country music on the radio. I relied on Rolling Stone magazine to help me shape my music tastes. Dave Marsh’s review of "Darkness" in July 1978 was so glowing that I felt I’d be missing out if I didn’t own the album. It was my first Springsteen album. “Born to Run” followed shortly thereafter (“Darkness” and “Born to Run” made my favorites list) and I owned “Greetings from Asbury Park” and “The Wild, the Innocent & the E Street Shuffle” by the time I packed my vinyl collection for college that fall. 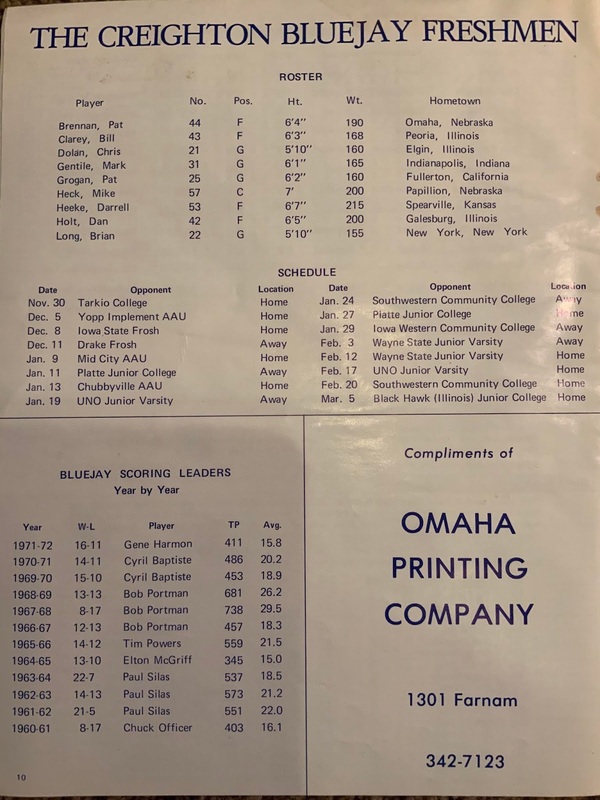 By the time I arrived at Creighton University in the fall of 1978, I was a full fledged “Boss” fan. When I joined a fraternity second semester, it just so happened a couple of my new "brothers" were from Jersey and were Bruce disciples. They inspired me to go on a two week tour following Springsteen and the Creighton Bluejays a year later. I'll save that for another post! Friday afternoons in the dorm consisted of backgammon or Spades games with the E Street Band as the soundtrack. 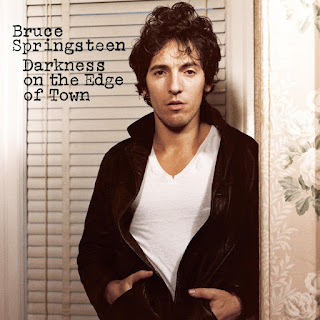 I played the grooves thin on those first four Springsteen album. I lived in the dorms my first three years as a student at Creighton University. During my junior year, five of my fraternity brothers and I decided we would move off campus to a large house on Cuming Street about eight blocks from campus. 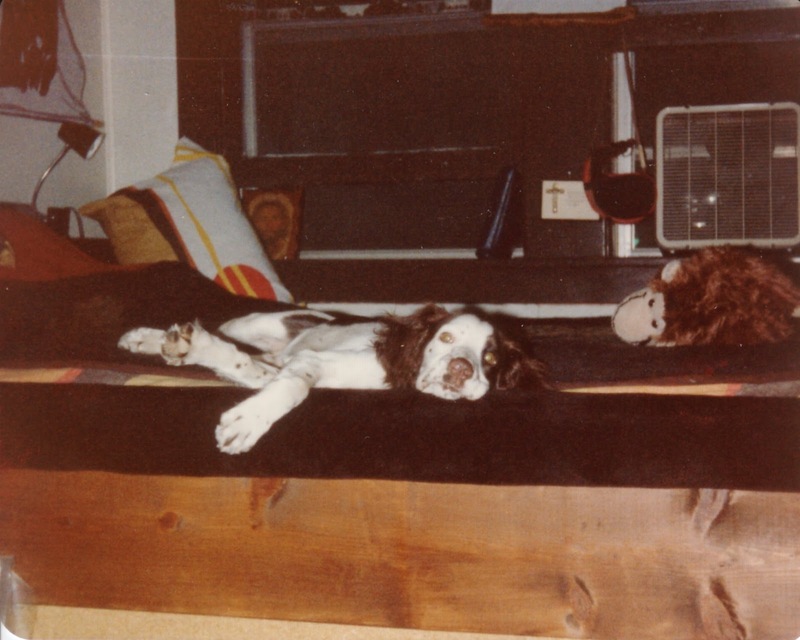 This decision allowed me to buy the dog I always wanted. I pulled the trigger a bit earlier than I was supposed as I bought the dog while I was living in the Palms (now Kenefick Hall). Dakota, my six week-old English Springer Spaniel lived in the dorm with me for about two weeks before the spring semester ended. That presented a few special challenges and a few messes on the floor. But with the help and understanding of my two roommates, we made it to the end of the semester. Dakota laying on my waterbed in our "corner room". We moved into the house, a three-story, six-bedroom palace, in late May. I claimed the corner bedroom on the second floor that looked out over the roof of the over the back third of the house. I had seven windows that opened up to this roof. The roof was just below the bottom of the windows. Dakota could jump out the window onto the roof and relieve herself and then come back into my room. That particular skill became a priority as soon as we moved in. After a few successful ventures onto the roof and some heaping praise, Dakota figured it out. Needless to say, taking a leak worked fine - no residual. The other trips, did present a bit more of an issue. Last year I watched (and helped a little) as NADA planned NADA100, a celebration of 100 years of service to dealers. The celebration in New Orleans was spectacular and everyone I talked to who attended had a great time. It was a gala worthy of the occasion. It was great to walk down memory lane and recap the rich history of both our trade association and our industry while also celebrating its future. The automobile industry has been an integral part of our nation's history. 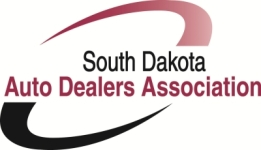 Perhaps even more remarkable is that the South Dakota Automobile Dealers Association is celebrating 100 years of service to South Dakota dealers this year. Committees and staff are planning a celebration of this milestone to be held in Sioux Falls, June 13-15. Details of this grand event will be coming soon but I urge you to mark those dates on your calendar. This will be a celebration of the history of the automobile industry in our state and if you are reading this, you are an important part of that history. Encourage other dealers, current and past, to join us for this great celebration of the automobile industry in our state. I know one thing about car dealers, we DO know how to celebrate. I started working with kids in the summer of 1976 when I was the Assistant Summer Rec Director for the City of Chamberlain. Eventually I was the director and went on to coach baseball, basketball and football. 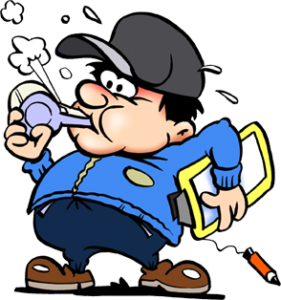 I have worked with kids in some way ever since - some forty plus years. When my wife and I moved from Omaha to Des Moines in 1984, I volunteered to coach a baseball team. The boys were 12-14 years old and we had a good summer. I enjoyed working with them and I believe the boys had fun. We were respectable - I think we were about .500. Toward the end of the season, one of the fathers asked me if I'd be interested in coaching the St. Theresa's Cardinals. We belonged to St. Theresa's Parish and several of the boys on the baseball team would be on the football team so I agreed to coach them. So later that summer, I went to an organizational meeting at one of the other Catholic churches in Des Moines. I could tell from the minute I entered the room that this was not going to be like my baseball experience earlier that summer. The room smelled like testosterone and I think I saw guys keep getting up and peeing in the corner!! This room was full of guys determined to relive their football glory days! Time to Feed the Wolf! Looking for a place to stay in the Black Hills? Check out the Big Pine Lodge on Terry Peak! Share book reviews and ratings with Doug, and even join a book club on Goodreads.